Hints: 1. - The computer programs are supposed to be self explanatory. Examples of input and output files are given. 2. - Since 06-03-1016 the source code of the software was made available for free download on the source code page. Acknowledgement: I acknowledge the contributions of users of the software worldwide who, through their valuable observations and suggestions, have helped to continually improve the software. Contact: I would appreciate it to learn about your experiences. For this there is a contact form . Click on any of the following 16 programs for more information and free downloads. This is a mathematical, numerical simulation model describing the relations between agriculture, crop rotation, and irrigation. Factors like rainfall, potential and actual evaporation (evapotranspiration), climate, and hydrology play also a role. The model calculates depth and level of water-table, capillary rise and deep percolation as well as the salt balance in the soil It gives graphs of soil salinity and subsurface drainage by drains or wells. There is ample attention regarding the reuse (conjunctive use) of ground and drain water from wells. Finally, the model includes farmers' responses to water logging and soil salinity. SahysMod This is a combination of Saltmod with a hydrologic model of ground water flow and hydraulics to account for large spatial variation through a network of polygons. It includes phreatic (unconfined) aquifers as well as soil layers with slow vertical hydraulic conductivity (soil permeability for water) resulting in semiconfined (leaky) aquifers. SaltCalc This is simplified version of SaltMod with the advantage that calculations are made for shorter time steps (monthly instead of seasonally or even daily). SaltCalc can be used when field observations of irrigation, water table and soil salinity have been made and one wishes to develop a model for that situation and for the maintenance of the salt balance in the soil. Normally, calibration of unknown values must be done using a range of values of the corresponding variable, running the model repeatedly and selecting the optimal value from the range that gives model results closest to observed values. PolySalt This is simplified version of SahysMod with the advantage that calculations are made for shorter time steps (monthly instead of seasonally). The application principles are similar as those described before under "SaltCalc". LeachMod This model is somewhat similar to SaltCalc. On the one hand the water management options are fewer (e.g. re-use of drainage or well water for irrigation do not feature here), but the model is more modern in the sense that the variable input for each time step is given in a table so that the calculations over all the time steps are done in one go. Moreover, by inserting the observed values of soil salinity in the data table, the model optimizes the leaching efficiency of the soil automatically so that the optimal salt balance can be found. This helps in hydrologic modelling of effective rainfall, recharge, and water storage. It calculates runoff, surface drainage and discharge relations in hydrological catchment areas (watersheds) using the concept of a nonlinear reservoir. It contains a calculator for agricultural drainage systems with pipes and ditches. The NashModel, like RainOff, calculates surface runoff and stream flow from rainfall. However, instead of a non-linear reservoir it uses a cascade of linear reservoirs, an idea elaborated by Nash. In some cases it yields better results than RainOff, but in other cases absolutely not. The model was developed recently and put on this website on 17 August 2017. This hydrologic model does calculations on horizontal subsurface drainage systems in agriculture, hydraulic head, as well as depth and level of water-table in agricultural land. It comes up with a drain spacing using the energy balance of groundwater flow, but also the Darcy and continuity equation (mass balance/budget of water). It includes drain entrance resistance and soil anisotropy of hydraulic conductivity (soil permeability for water), i.e. the horizontal and vertical hydraulic conductivity are different. All is applicable to pipe/tile drains (drain pipes) and open ditches. WellDrain This hydrologic model calculates the spacing of wells, the shape, depth, and level of the watertable in vertical drainage systems using pumped wells. Like EnDrain, it permits aquifers with various different properties and, in addition, fully/partially penetrating wells. This model is meant for segmented (in splines, piecewise) cumulative frequency analysis using a breakpoint which serves for example to study discontinuous probability distributions and return periods. It can anlyse hydrologic factors like rainfall, river and drain discharge, water and river level. Also the depth or level of watertable, soil salinity, and the hydraulic conductivity (i.e. soil permeability for water) can be sudied. The software uses 20 different probability distributions and selects the best fitting. Preference for a certain distribution can also be expressed. An amplified version (CumFreqA), permitting to express preference for advanced composite distributions, can be made available on request. NormDis This is a two-way calculator for normal probability distributions with graphics: Value => Probability, and Probability => Value. The calculator can be used for many kinds of statistical probability analysis. SegReg This model can be used for segmented linear regression, i.e. regression in segments, using a breakpoint (break-point) or threshold value, which serves for example to analyse the relation between plant growth or crop production in agriculture versus soil salinity and depth of watertable in agricultural land. The software analyses 2x6 different types of models and selects the best fitting. An amplified version (SegRegA), permitting to express preference for a certain model, can be made available on request. PartReg This software is similar to SegReg but it emphasizes the horizontal part in Type 3 and Type 4 relations with the aim to define crop tolerance levels more precisely and to find the maximum range of "no effect". Further explanation is given on the PartReg page. F-test calculator This is a calculator for the Fisher's F-test as used in analysis of variance (Anova). The above SegReg model uses this test for the significance of the regression. Like NormDis, it is also a two-way calculator: F-value => Probability, and Probability => F-value. t-distribution calculator This is a two-way t-distribution calculator to perform a t-test on the significance of the difference between means (averages) of series of data using Student's t - probability distribution : t-test-value => Probability, and Probability => t-test-value. This ia an alternative, extended, calculator, originally developed by my grandson Niklas Burggraaff at 10 years of age (!). It is suitable for a long sequence of calculations as necessary in large equations. It has two input options (X and Y) and it can perform transformations of X and Y before doing the operations with X and Y. The results can be moved to X or Y to continue the next sequence of transformations and operations, or they can be stored for later use in X or Y. The record of actions is shown in a tracking table. The model LeachSalt is in development. It is an amplification of LeachMod permitting two neighboring areas with different irrigation treatments so that the salt balance in one area may influence the balance of the other. For example it simulates the capillary rise in one area with limited irrigation supply induced by the percolation from the second area with ample irrigation. Also, a simplification of LeachMod (SaltSim) is on the way in which the underground water movement and the subsurface drainage are eliminated. This model is applicable for experiments in lysimeters or in controlled field experiments with saline irrigation water. Check with the sitemaster for more info. Click on any of the above 16 programs for more information and free downloads. 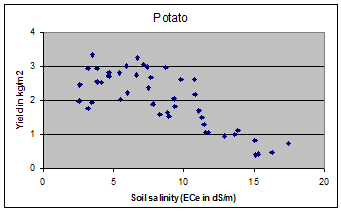 This data set of crop yield and soil salinity needs an analysis by a segmented regression software model to determine the response and salt tolerance or resistance of the potato crop. If the relation shows a not descending line in the first stretch of ECe values, e.g. from ECe=0 to ECe=7, then this is a stretch of "no effect", and the tolerance level can be set at ECe=7 beyond which value the yields start to decline due to negative influence of the saline soil. This data set of annually maximum 1-day rainfalls needs an analysis by probability distribution fitting to determine the frequency of occurrence of extreme values and the cumulative frequency. Such an analysis can be done with the CumFeq software model, which application program gives a histogram. It also calculates the correlation between predicted and observed values. The applicability of the probability distribution is expressed in terms of goodness of fit.